Token lemur. We are talking Madagascar! 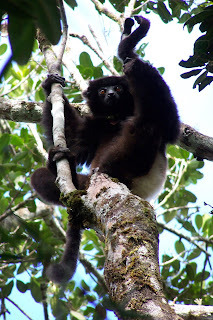 If you know anything about me by now, it is probably that I am obsessed with lemurs - that huggable primate found only on Madagascar (and some really small surrounding islands). While I've devoted an entire blog to my exploits in the country and have discussed two of the country's main export crops - coffee and cocoa - in some more recent ramblings, I have yet to discuss the issues of food insecurity in regards to my favorite African island nation. 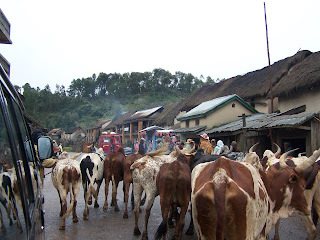 Well, seeing as I must post five days a week, on something related to food (and maybe tangentially vegan), and this week my eye is on Africa and Asia, I just had to end the week with a post on Madland. The island houses almost 20 million people, of which 60% live on less than $1 per day. And of that chunk of the population, 85% live in the rural parts of the country. 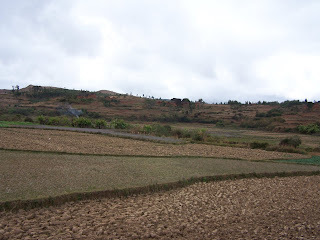 That means that agriculture is a critical component to the health and livelihoods of the majority of Malagasy people. It also means that the majority of Madagascar's population is extremely susceptible to the impacts of climate change on agriculture. While the news of late has focused on the hardwood extraction in industry in the country (one of the major drivers of deforestation), Madagascar has been experiencing some stressors of a different flavor. Agriculture is another major driver of habitat destruction in the tropical forests, but the climate seems to be taking revenge for the indiscretions. According to the World Food Program (WFP), over the past 40 years, the island has experienced over 50 natural disasters. Droughts, cyclones, and floods exacerbate the state of food insecurity in the country. Unfortunately, these are the types of natural disasters enhanced by climate change. The International Food Policy Research Institute (IFPRI) reported on a new climate change adaptation strategy that the Association for Strengthening Agricultural Research in Eastern and Central Africa (ASARECA) has developed for it's 10 member countries. Of the recommendations put forward, developing drought-tolerant and early maturing crop species was a common thread throughout the country-specific plans. Rainwater harvesting also made it into the strategy. The ASARECA strategy also considers decreasing investment in livestock, which use more resources, often degrade rainforests, and produce greenhouse gas emissions. Considering that droughts, storms, and flooding often cut short a growing season or completely decimate a crop, moving forward on these measures is critical to the improvement of livelihoods of the country's population. Madagascar was ranked 145th/177 by the UNDP for food security (that's pretty bad), and 25% of the rural population is considered food insecure. Living in an industrialized nation we have yet to feel the full impacts of shifts already taking place due to climate change, but to many developing nations in the global south it is already a reality, and they are trying to deal with present and future consequences. Now that's some food for thought.